One Two Oh – It’s Football! This fall, the University of Texas fields its 120th “official” football team. In the 1880s and 1890s, the new sport of football – an Americanized version of English rugby – was already immensely popular along the East Coast. At the time, the “Big Three” college teams: Harvard, Princeton, and Yale, were closely followed by newspapers and magazines, and the annual Princeton vs. Yale game on Thanksgiving Day was so well-attended, it had to be played on neutral turf in New York City before 40,000 – 50,000 fans. In Texas, football had a rougher beginning. When the University first opened in the fall of 1883, students in Austin were aware of the sport. In early December of that year, perhaps inspired by the news reports of the Princeton – Yale game, a few UT students put together a makeshift team, but there weren’t any opponents available for a game. Fortunately, a member of the UT squad was working as a part-time tutor for students at the Bickler School, a private high school which held its classes in a building just west of the Capitol. A game between the two schools was proposed and accepted, and about a week later the University of Texas played the Bickler School on a field near the present day Blanton Museum of Art. While neither team could brag about its football prowess, the Bickler team fared better, and outscored UT two goals to none. The game was immortalized in a poem printed in the inaugural edition of the Cactus Yearbook in 1894. But after the defeat, football at the University of Texas was decidedly unpopular. For the next decade, students would sporadically play intramural football one year, and ignore it the next. It wasn’t until the fall of 1893, as the sport continued to become more well-known in the state, that the University finally fielded its first “official” squad. The opening game was against the undefeated and favored Dallas Football Club on their field on Thanksgiving Day, 1893. In front of 1,500 fans, and dressed in black and white uniforms with gold caps, the UT squad pulled off the upset. “Our name is pants and our glory has departed,” moaned The Dallas Morning News. There still weren’t too many opponents available, so the team only played four games: the Dallas Football Club and the San Antonio Football Club in the fall . . . and, well, the San Antonio Football Club and the Dallas Football Club the following spring. But the UT team won all four games and staked its claim as the best in Texas. 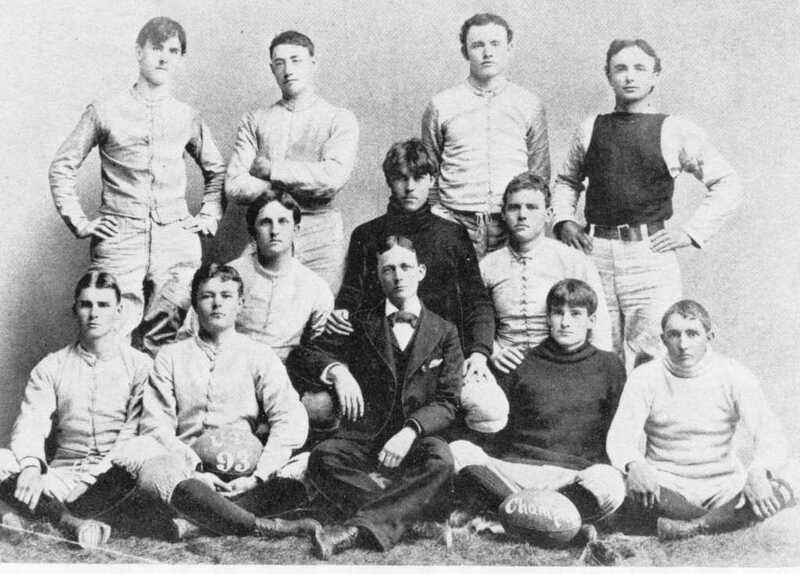 Photo: The 1893 UT football team. Great post! I really enjoyed it! Keep em coming! P.S. Even in 1893, I’m pretty sure OU still sucked!